I collected the materials: the plants, black garbage bags, a scalpel, the clips, latex gloves, antibacterial soap, pre-written plant labels. 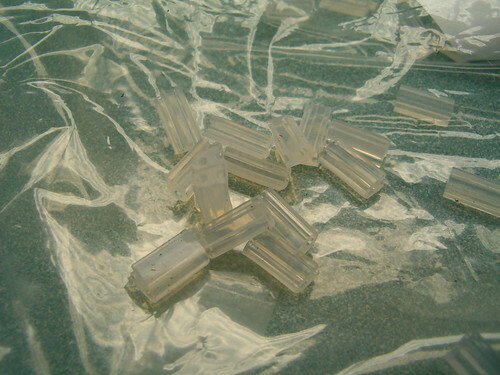 Here’s a picture of the clips. I had both 1.5 mm and 2.0 mm grafting clips. It was a good thing I had both sizes, because I needed them! I washed my hands and the scalpel, put on the gloves, and got ready to graft. I didn’t take any step by step pictures for you. Maybe next time. I can definitely show you the carnage though. These are all the tops of the rootstock tomatoes and the bottoms of the grafted scion varieties. Here’s a closer look at one of the grafts. This one doesn’t look like the top and bottom are quite the same size. It’s hard to tell with the different colors. After the grafting was finished, I put the plants into my extremely rudimentary healing chamber. 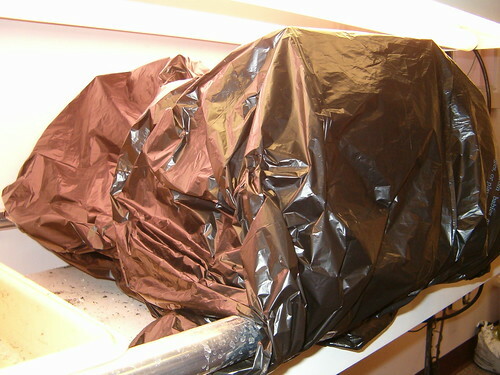 It needs to be dark (black garbage bags), 90-95% humidity (plastic bags), 70-80 degrees (under the lights in my office). 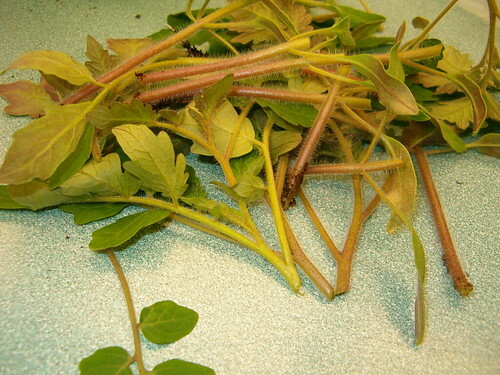 According to the literature, any grafted plants that are not wilted after a day or two will probably survive and develop healed grafts. We should see the results by the end of the week. 1. I think most of the plants were too big…too big for the clips anyway. I should have done the grafting last Friday. 2. I didn’t get great matching of stem sizes between the tops and bottoms. Only a few of the grafts really matched well. 2b. I didn’t do a great job getting the same angle of cut on both the top and the bottom. I probably should have done a straight cut rather than trying to be fancy. 3. My healing chamber is extremely low-tech. It doesn’t control the conditions very well. I might need to go for something a little more professional than sticks and the cheapest possible black garbage bags. I’ll try to post more pictures later this week! Posted on February 8, 2011, in Around the Garden, Working in the Garden and tagged tomato grafting, Tomatoes. Bookmark the permalink. 5 Comments. I’m looking forward to seeing this entire process through!! Good Luck! 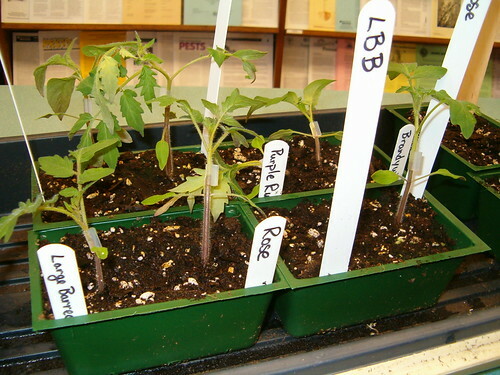 I’m thinking about purchasing some grafted tomatoes through Territorial seed…..
Master Gardener from Baltimore County, MD here, just cruisin’ the net. Grafting is so HOT!!! I read your comment about not getting the angle of the cuts just right and have this suggestion which comes from precision cutting in other disciplines. Let’s see if I can do it in less than a thousand words ( camera broken so can’t save a thousand for you ….) 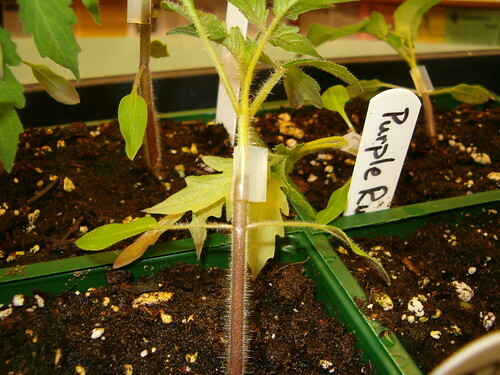 Select a rootstock and scion seedling that visually seem to be the right size for each other. Lay them as close together as possible and decide where you cut will be. Move one or the other up and down till a perfect size match is apparent. Cut both simultaneously on an angle and the angles will fit each other like pieces of a puzzle. Practice on two straws to get the concept. That might work….I think the challenge with how we were doing it was that the pots were too big to easily get both stems next to each other to make the cut precise. It would be something to consider for planting in the future. Thanks!